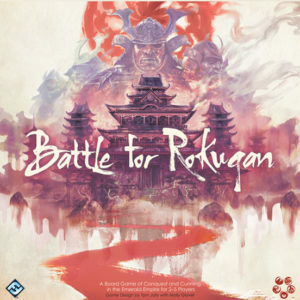 We review Battle for Rokugan, a new area control board game published by Fantasy Flight Games. Battle for Rokugan is set in the world of the Legend of the Five Rings and puts players in charge of rival clans as they battle for control. Game reviewers are tasked with capturing the complete view of a game, especially with regards to the enjoyment and engagement it delivers. If a game isn’t interesting, or it has some fatal flaw, readers need to know about it. Beyond that, cultural insensitivities or philosophical considerations a game brings are generally beyond the scope of a review. With any game, theme is a consideration and judgment of the quality of the theme can only affect a review insomuch as it affects the gameplay and enjoyment. Any theme which seeks to portray it’s subject without betraying or misrepresenting its nature is generally fine. Whether or not the publisher can take ownership of the theme is something else. And so, this review of Battle for Rokugan won’t address issues of cultural appropriation. As someone of mixed cultural descent and who is unfamiliar with the Legend of the Five Rings theme (on which the game is based), this reviewer isn’t concerned much with how well the theme is crafted, only how well it works for this game. And of course, the main concern is how good the game is. 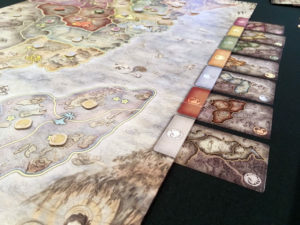 Battle for Rokugan is an area control game for 2-5 players, with players representing the Asian-inspired clans of the world of the Legend of the Five Rings. It plays in about 60 to 90 minutes depending on the player count and plays best with 3 to 5 players. Starting a game is similar to the beginning of a game of RISK. 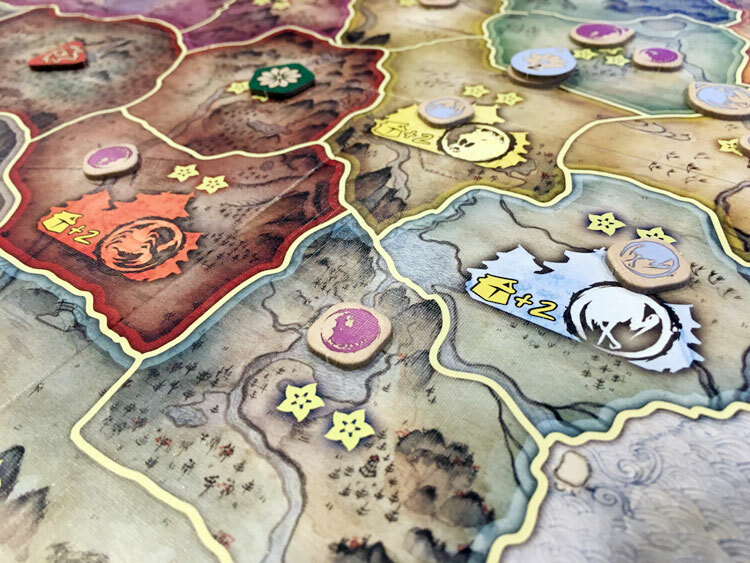 Players will take control of territories on the board and if they manage to gain all of a particular color group, they gain a power card that provides a one-time bonus. Additionally, players are provided with 27 combat tokens in their player color including a single bluff token. Finally, players receive a couple of action cards and have choose from two objective cards. A player’s shield keeps hidden the tokens ready for placement. Over the course of five rounds, players take turns in phases by playing and resolving combat tokens. These show a military or action symbol on one side and the clan symbol on the other. Over the course of an individual round, a player will draw five tokens and, during the placement phase, place them on various territories to attack, defend, sabotage, or force a peace. During the resolution phase, all tokens are resolved simultaneously with the player having the greatest attack strength gaining control of a province. If the defender ties or exceeds the attack, or if multiple attackers tie, the defender retains control. Other tokens included in the mix are Navy tokens strictly for an amphibious attack, Raid tokens for destroying a province, and Peace tokens to remove a province from play by permanently granting ownership to the token user. One token in every hand is a player’s Bluff token. It can be played, but the token has no effect besides making an opponent think twice about what the token is being used for. After five rounds, the player with the highest victory point value in provinces wins. Points can also be gained from completing the objective chosen at the start. Each province is worth a number of victory points equal to it’s stars. Control markers show which player owns the province. In short, Battle for Rokugan is a wonderful game with everything glorious about area control games rolled into one delicious maki. The simple nature of play and the aggressive relentless style that forces table talk diplomacy is something that begs for repeated replay. The main components of this praise are easy to identify. Players can also acquire territory cards by controlling all the provinces of a particular color or group. Teaching Battle of Rokugan could not be simpler. Explanation of cards, game rounds, and use of the various tokens is almost completely straightforward. There are some nuances to different types of token placement, but on the whole, the game can be taught in as little as 10 minutes. Also pretty basic is the mechanism for drawing and using tokens every round. Because of the random nature of the draw, players will need to consider their strategic goals (probably from their Objective card) against the tactical options that can be implemented from tokens. Thankfully, the game provides a means to use any token as a bluff in some way and tokens normally for attack can sometimes be used to shore up defense, even if no attacker is present. It’s impressive to see such an array of choices in such a basic mechanism as this. The feeling of play is reminiscent of Diplomacy with speedier resolution. Objective cards award end game points for accomplishing… um… objectives. One mild criticism could be laid upon the powers granted by the Shadowlands (Mordor) cards. 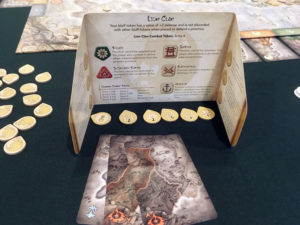 They seem to be really powerful and if a player’s objective is already to take control of the Shadowlands, the points from this venture could outweigh the 0 points received from controlling the territory. Players should be mindful of Objectives during play because they can cause a dramatic swing in points at the end. This leads to the nature of the territory cards. 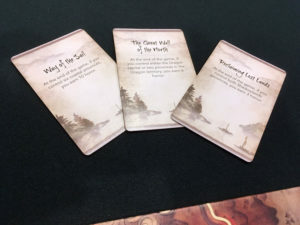 Since each card, once gained, has a one-time-use power, it’s common for players to use them right away if they feel they will lose control of the territory. The powers are interesting and exceptional, and often just preventing a player from gaining a card is a goal. With all of these “sidequests”, it’s deceptively hard to remain focused on a single strategy. 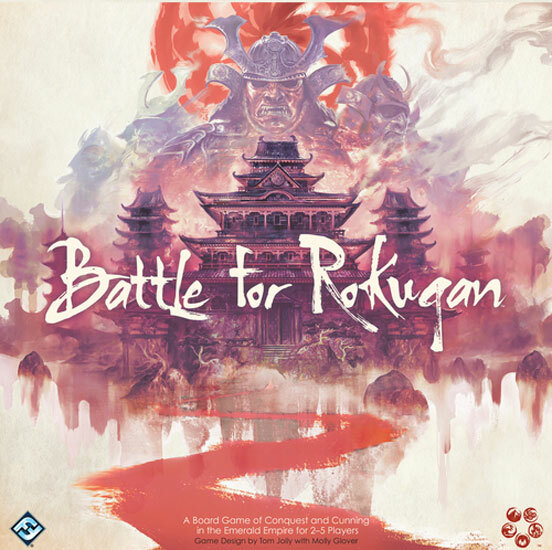 Battle for Rokugan is easily one of the top area control games of 2017. It’s easy to see this game accepting an expansion with more cards and tokens to enhance play. What’s more, the nature of the shifting goals and clan abilities keep multiple plays fresh. It’s worth it to note that repeated back to back plays won’t be satisfying every time, but the design choices and direct conflict nature of Battle for Rokugan are near perfection. 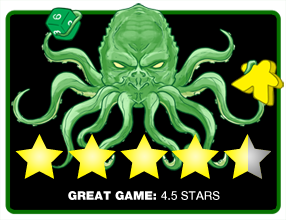 Final Score: 4.5 Stars – Simplicity and the spirit of a classic title set in a well-deserved IP is a combination for a tremendously fun game.